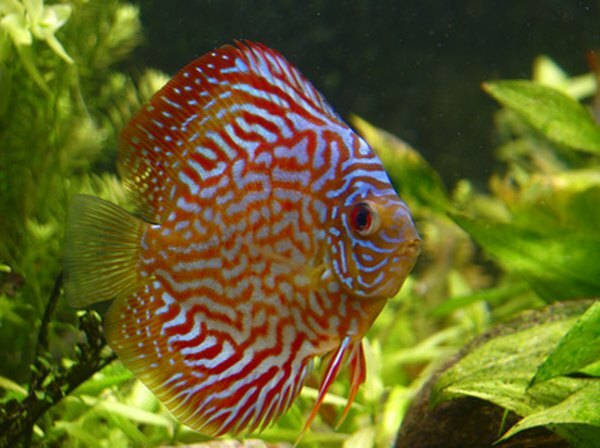 Discus fish are cichlids that feed their young body slime. The cichlids are a diverse group of fish that vary greatly in temperament, size and appearance. However, most cichlids provide some degree of care for their young, a rarity among fish. Spawning cichlids allows you to see these interesting behaviors. You can induce most cichlids to spawn easily. Whenever you prepare to spawn cichlids, you should condition them for several weeks. Feed them hearty, nutritious foods. This will help them gain strength needed for spawning. Use live and frozen foods, like brine shrimp, bloodworms and mosquito larva. 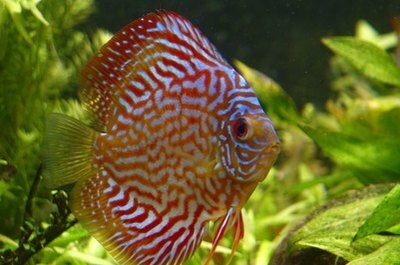 Additionally, many cichlids need vegetable matter, so include foods like spirulina flakes. Mbuna cichlids from the Rift Valley in Africa should be given extra green food during conditioning . In the wild, fish use a number of cues to determine when to spawn. You can simulate many of them in your aquarium. For example, slowly raising or lowering the temperature triggers spawning in some cichlids. A large water change mimics spring rainstorms, another trigger. Even feeding them conditioning foods can trigger spawning, as this is an indicator that there is enough food to raise fry. Research your particular species for known triggers. If you can't find information on breeding your species of cichlid, look up related species for hints. Cichlids come from diverse areas. African Rift Valley cichlids like mbuna and haps need very hard, alkaline water with plenty of dissolved minerals. South American cichlids that live in the Amazon drainage, such as rams, angelfish and discus require soft, acidic water. Research your individual species of cichlid to see what sort of water it comes from. Many cichlids can survive in a wide range of conditions, but most only spawn in ideal water conditions. In addition to food, triggers and water, fish need the right tank to breed. Many cichlids only spawn if they feel safe. Small, rocky caves make mbuna cichlids feel safe and more likely to spawn. Conversely, hap cichlids, which live in the same lakes as the mbuna, prefer open water, and need a large tank with open spaces. Since two groups of cichlids from the different parts of the same lake need such radically different conditions, research your species' habits.